TORONTO, ONTARIO--(Marketwire - Dec. 18, 2009) - ANDINA Minerals Inc. (TSX VENTURE:ADM) (the "Company") today announced initial results from the strategic exploration program at the Ojo de Agua East gold target, located at the Company's Volcan Gold Project in Chile. The program included mapping, sampling and trenching and demonstrated the surface signature of gold mineralization over an area of approximately 0.4 km2. Ojo de Agua East is located on the properties acquired from Barrick earlier this year (see press release dated May 21, 2009), 2 km to the east of the Ojo de Agua area, where Andina has already identified an inferred resource of 18.6 million tonnes grading 0.85 grams per tonne (g/t) gold (Au) at a cut-off grade of 0.5 g/t being 510,000 ounces of gold. The Ojo de Agua East target is 6.5 km away from the Dorado deposits, which contain measured and indicated resources of 492.5 million tonnes at an average grade of 0.62 g/t Au being 9.8 million ounces of gold and are the focus of development studies by Andina. The main purpose of the Company's 2009-2010 strategic exploration program is to identify higher grade mineralization in close proximity to the Dorado deposits. "Our initial exploration confirms the potential of Ojo de Agua East to host significant mineralization," said George Bee, President & CEO. "Based on these positive results, we have commenced drilling of the target to better define mineralization in the core area and expect to report results starting in February." All assays were performed by Geoanalitica, La Serena Chile. Based on the trenching, mapping and sampling results to date, an initial RC drill program of approximately 1,200 metres in three drill holes has commenced at Ojo de Agua East in order to characterize the mineralization below Trench 1, Trench CH, C1 and the southern portion of Trench 2. Further drilling and geophysics is planned, pending initial drill results. The Ojo de Agua East alteration zone reflects the upper levels of a porphyry gold environment comparable to the Dorado West Top Zone. The Ojo de Agua East zone is characterized by the presence of two intrusions which cut altered volcanics of which the younger and less altered intrusion acts as the typical central heat engine for mineralization. This intrusion is more irregular than at Dorado but best grade mineralization is clearly associated to border zones with black and grey banded quartz veins, which is a characteristic pattern of all Dorado and Maricunga deposits. A previously unknown older intrusion is outcropping at the southern end of the target area. It is more altered and cut by magnetite–chlorite veinlets, indicating a deeper and hotter contact zone environment. Its relationship to the gold porphyries is not yet clearly understood. The volcanics which overlie the gold porphyries were affected by advanced argillic alteration and by wide spread steam heated alteration, which overlies the deeper gold porphyry environments. The trenching program at the Ojo de Agua area of the Volcan Gold Project was reviewed and the results approved by Mr. Michael Easdon, Andina's Qualified Person under National Instrument 43-101. Mr. Easdon has been responsible for preparing technical information on the Ojo de Agua area of the Volcan Gold Project, which is disclosed in the Company's annual information form for the year ended December 31, 2008 (dated April 8, 2009). Mr. Easdon has reviewed the contents of this press release. The technical review of the Ojo de Agua area utilizes QA/QC (quality assurance and quality control) protocols for assaying and trenching samples. Grab samples are selected pieces of rock collected to identify or confirm anomalous or potentially economic concentrations of precious metals (Au, Ag), base metals (Cu, Mo, Zn, Pb), as well as path-finder elements commonly associated with epithermal mineralization (As, Sb, Hg, Ba). Chip-channel samples are one or more continuous samples of mineralized or altered rock collected with hammer and chisel over a measured interval and may be taken from areas of outcrop or from trenches. Sample locations are determined at the time of collection with handheld GPS readings. Andina does not intend to use the assay data obtained in this way from either chip channel (trenching) or grab samples in any calculation of resource estimates. The samples in this program have been collected to confirm previously reported exploration sampling results and to further identify areas of greater interest for more detailed future exploration and drilling. All samples are delivered by the Corporation's personnel to the Geoanalitica sample preparation facility in Copiapo, Chile where they are crushed, pulverized and shipped by Geoanalitica to their assay facility located in Coquimbo. Geoanalitica analyses the samples for gold, copper and molybdenum. The gold assays are performed utilizing 30g fire assay with an atomic absorption spectroscopy (AAS) or gravimetric finish; the Cu and Mo are assayed for using standard wet analytical techniques. Sample pulp splits are subsequently sent by Geoanalitica to the ALS-Chemex laboratory (also in Coquimbo) for multi-element inductively coupled plasma (ICP) analysis. Andina's primary focus is mining exploration and development in Chile. The Company's flagship property is the 100%-owned Volcan Gold Project, strategically located in the prolific Maricunga Gold Belt. 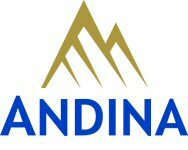 In September 2009, Andina provided an updated resource estimate for Volcan including measured and indicated mineral resources of 492.5 million tonnes at an average grade of 0.62 g/t Au for 9.8 million ounces of contained gold and inferred mineral resources of 36.8 million tonnes at an average grade of 0.65 g/t Au for 768,000 ounces of gold. This release contains forward-looking statements, including predictions, projections and forecasts. Forward-looking statements include, but are not limited to, statements with respect to exploration activities and results (including the timing of results), the timing and success of exploration activities generally, permitting timelines, government regulation of exploration and mining operations, environmental risks, title disputes or claims, limitations on insurance coverage, timing and possible outcomes of any pending litigation and timing and results of future resource estimates or future economic studies, and in particular include statements with respect to the timing of the reporting of drilling results at Ojo de Agua East commencing in February, 2010, Often, but not always, forward-looking statements can be identified by the use of words such as "plans", "planning", "planned", "expects" or "looking forward", "does not expect", "continues", "scheduled", "estimates", "forecasts", "intends", "potential", "anticipate", "does not anticipate", or "belief", or describes a "goal", or variation of such words and phrases or state that certain actions, events or results "may", "could", "would", "might" or "will" be taken, occur or be achieved. Forward-looking statements are based on a number of material factors and assumptions, including the result of drilling and exploration activities, that unexpected geological conditions or formations are not located, that contracted parties provide goods and/or services on the agreed timeframes, that equipment necessary for exploration is available as scheduled and does not incur unforeseen break downs, that no labour shortages or delays are incurred, that plant and equipment function as specified, that no unusual geological or technical problems occur, and that laboratory and other related services are available and perform as contracted. Forward-looking statements involve known and unknown risks, future events, conditions, uncertainties and other factors which may cause the actual results, performance or achievements to be materially different from any future results, prediction, projection, forecast, performance or achievements expressed or implied by the forward-looking statements. Such factors include, among others, the interpretation and actual results of current exploration activities; changes in project parameters as plans continue to be refined; future prices of gold; possible variations in grade or recovery rates; failure of equipment or processes to operate as anticipated; the failure of contracted parties to perform; labour disputes and other risks of the mining industry; delays in obtaining governmental approvals or financing or in the completion of exploration, as well as those factors disclosed in the company's publicly filed documents. Although Andina has attempted to identify important factors that could cause actual actions, events or results to differ materially from those described in forward-looking statements, there may be other factors that cause actions, events or results not to be as anticipated, estimated or intended. There can be no assurance that forward-looking statements will prove to be accurate, as actual results and future events could differ materially from those anticipated in such statements. Accordingly, readers should not place undue reliance on forward-looking statements.